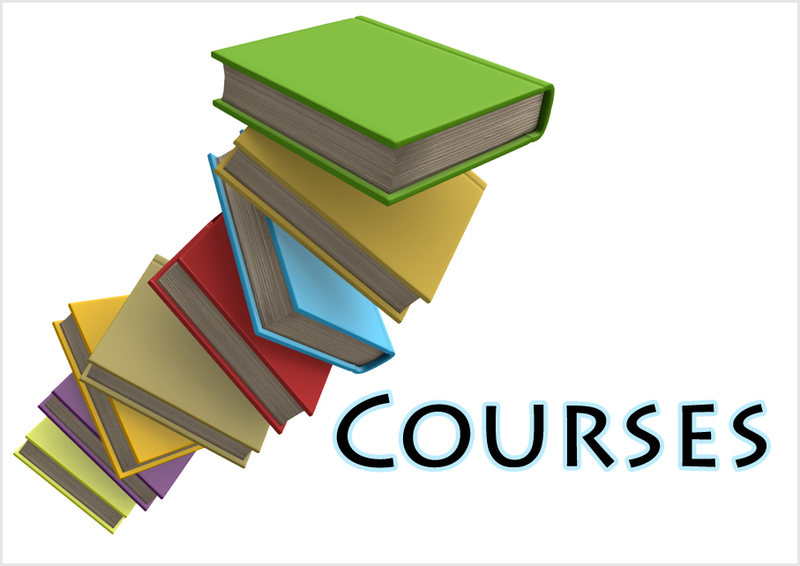 All students should attend classes, according to, their batch time regularly. Students must respect their teachers and avoid arguments or fault finding. Students must enter the class room with in 20 minutes from the starting of their respective batch time, after the lapse of said time, no student shall be allowed to enter the class or lab room. A telephonic call will be made to their parents to confirm the reason of late coming. 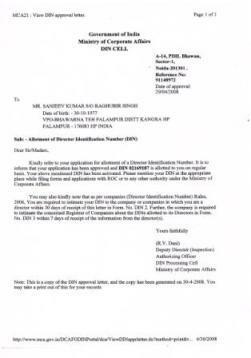 For leave, student must write a application to centre director/head or write a reason for the same in the register maintained by the affiliated center director/head. 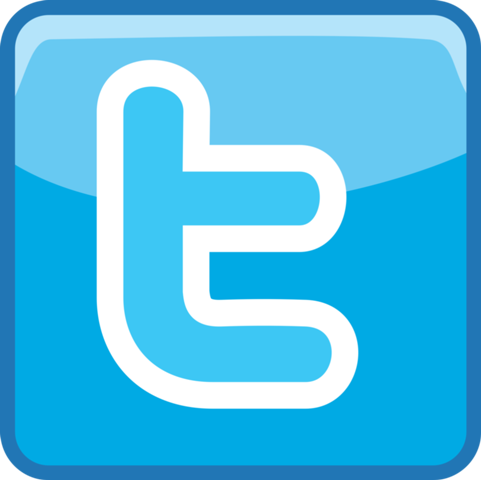 Students cannot use mobile or cell phone inside the class, the same can be used only outside the class and mobile will be kept on vibration mode while attending the class. 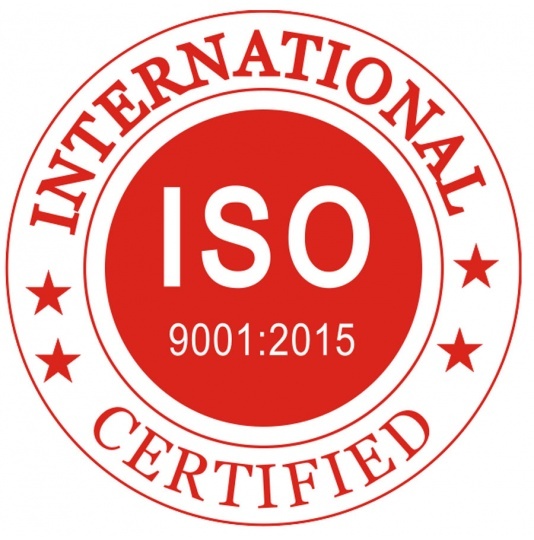 It necessary to appear in the weekly/monthly test, as prescribed by center director/head. Students have to maintain separate notebooks for test, rough works and home works. Regular checking of home work’s notebooks to concerned course faculty, is necessary. Practical + viva marks will be given on the basis of student’s performance in the weekly/monthly test & regular checking of home work note books. Students will not enter and exit the classroom without the prior permission of computer teachers/instructor. No noise will be made inside and outside the class room of our affiliated computer franchise center. Our computer institute franchise head will not be liable for any loss of books, notebooks, begs etc. left at its premises by the students. No student is allowed to enter inside the "genuine- computer education franchise center" class/lab room by accompanying with visitor/relative/friend. Students will bring bags, class works notebooks & ID-Card. Tuition fee shall be deposited- before 10th of every month. If fee is not deposited within prescribed time, 10 to 50 Rs. shall be paid extra as late fee to computer franchise centre head. 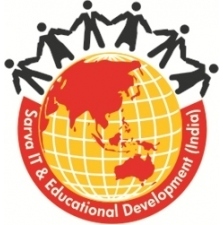 Students can get the facility of transfer from one Sarva Centre to another with having written permission from our | recognised computer education franchise| centre head/director. Absent from classroom will cause Rs. 10 fine; the same shall be included with monthly tuition fee. Admission/registration /Tuition Fee once paid shall not be refunded in any case. If any student wants to quit his/her certificate/diploma/other course, he/she has to serve one month prior written notice or application for the same to centre head/director and get NOC for the said quitting of course. If he/she fails to do so, action shall be taken against him/her. Students must confirm their Enrollment No. or Roll No. from C.O- H.P by making telephonic calls directly to Sarva Director H.P. Students have to follow batch wise procedure for theory & lab classes, made by the computer centre franchise head. It will be the duty of student to take receipt for all types of fees from our affiliated computer centre- head. 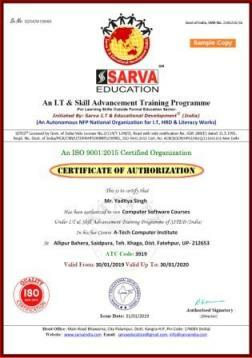 The certificate & diplomas to be issued only after -the confirmation of student’s registration with Sarva Education - successful completion of the course- obtaining NOC from centre director/head. Students have to follow the rules enforced by the centre director in the sake of their study. 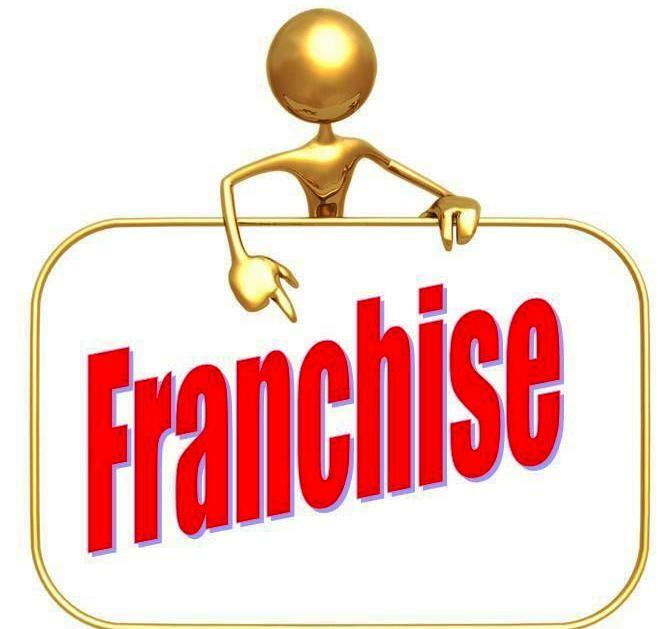 Student can get ID-CARD of Sarva Education from our computer franchise center head within the period of 30 days after registration with Sarva education (SITED). 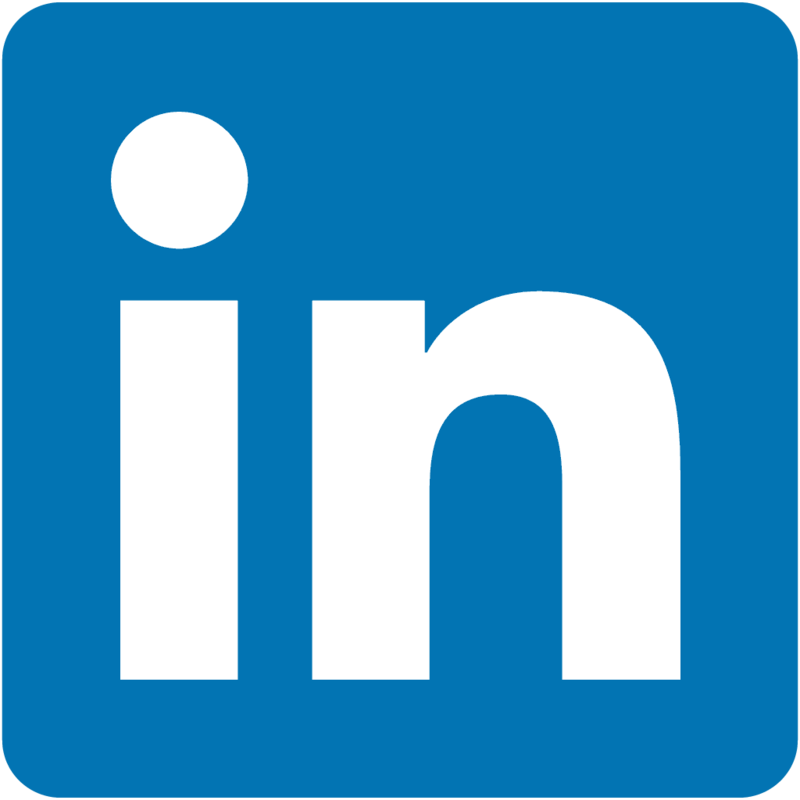 Sarva education will provide job assistance to deserving candidates only. 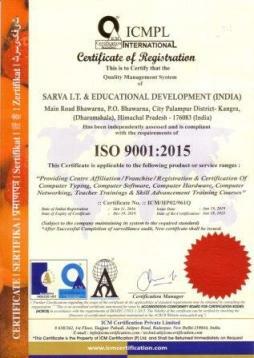 Sarva I.T & Educational Development is a NFP autonomous organization (Certified/Licensed by- Govt. of India) which is running various skill advancement courses outside formal education sector under its skill advancement Training awareness Programmes on not for profit basis and designed various job oriented basic certificate and diploma courses in non-formal learning to eliminate/overcome the burning/prevailing problem of unemployment, so that student can be able to get employment and self-employment business opportunity in the present era of competition, specailly in private sector/non formal sector. 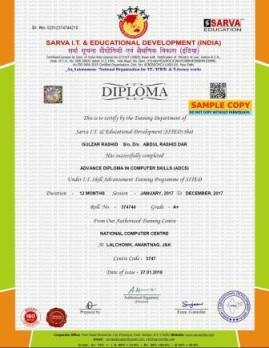 Student will get Sarva I.T & Educational Development titled, printed, certified & issued diploma and certificates. These diploma and certificates are applicable for N-F sector jobs, but before applying for concerned jobs always read requirements, rule & regulations, Guidelines made for concerned post/vacancy/job, by concerned departments. Students will pay prescribed fee of courses to computer education franchise centre head. 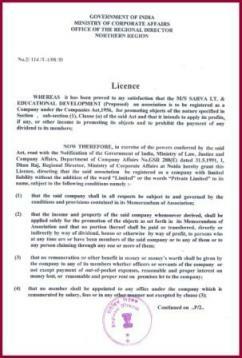 Sarva Education charges onetime nominal registration/enrollment fee from student for certificate/diploma through centre head. 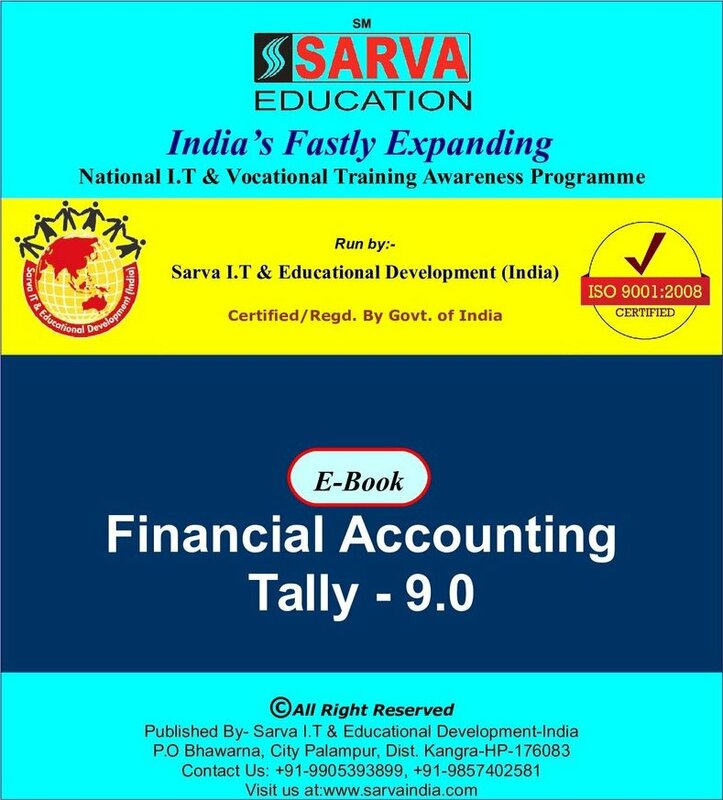 Sarva Education will not have any sharing in Admission/tuition/Exam fee and all such types of fees will be prescribed by concerned centre head, as per investment, infrastructure,facility provided in computer literacy centre, geographical condition of area, literacy ratio & backwardness of area. So Sarva education will not be held liable on fee issues/disputes between centre head or students and all such issue/disputes will be mutually settled between student and centre head. Sarva Education will give suggestion only on this issue/dispute. If student is minor (Under 18 Years) at the time of taking admission into any sarva courses, then guardian signature is necessary on admission form. Decisions taken for the sake of student by Sarva Education will be final, acceptable and binding to everyone. 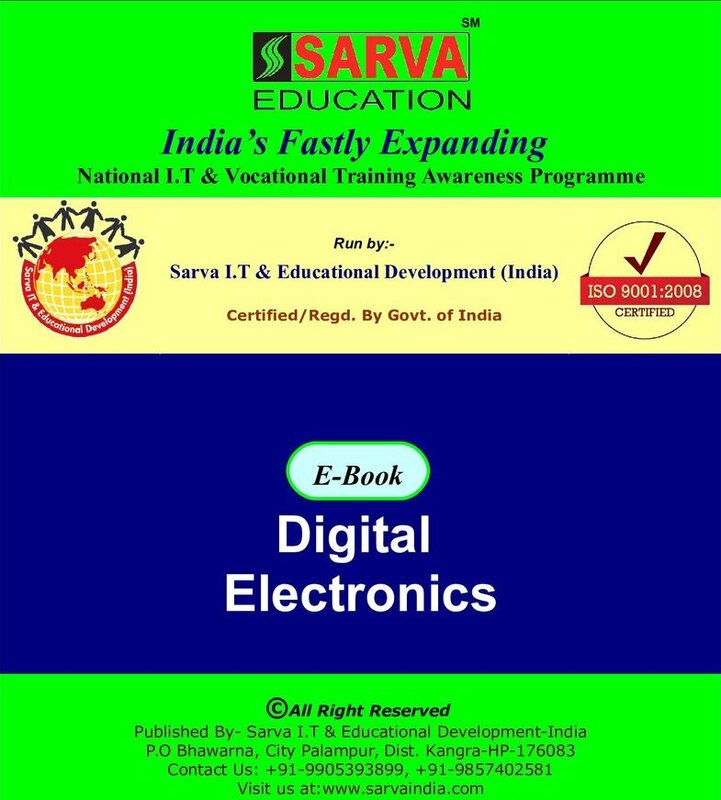 Sarva Education may change, revise any of the above mentioned Notice/rules & regulations from time to time as per requirements without any prior notice to students. 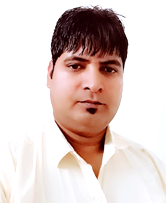 To learn/get computer education- students must have knowledge of English, otherwise teachers will not be able to impart you good teaching standard. 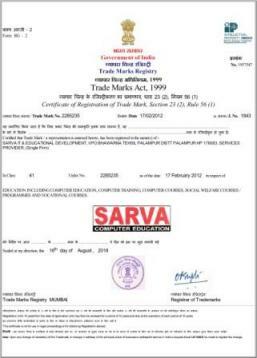 For the validity of Centre, Please Verify centre authorization on www.sarvaindia.com. If You (Student) are accepting above mentioned Clarification/notice/rule & regulations then you can take admission into any course of SITED, Otherwise not. No excuse shall be entertained after admission in any case whatsoever. 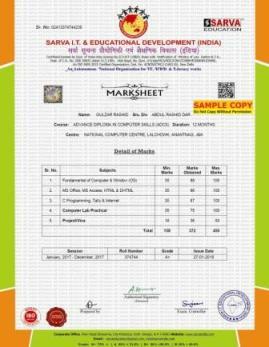 TO CONFIRM THE VALIDITY OF YOUR DIPLOMA PLEASE VERIFY YOUR ROLL NUMBER AT "VERIFY STUDENT DETAILS" COLUMN MADE AT www.sarvaindia.com. 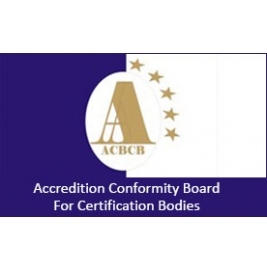 Renew your Recognised Ccomputer Education Franchise, Recognised Computer Institute certificate every year on or before renewal date. 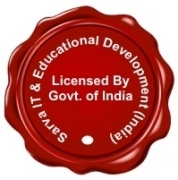 If your recognised computer centre is not renewed on or before renewal date, then your centre will automatically deem to be cancelled without any prior notice and other Recognition/Affiliation to OPEN/Start New computer center will be allotted in the same area. 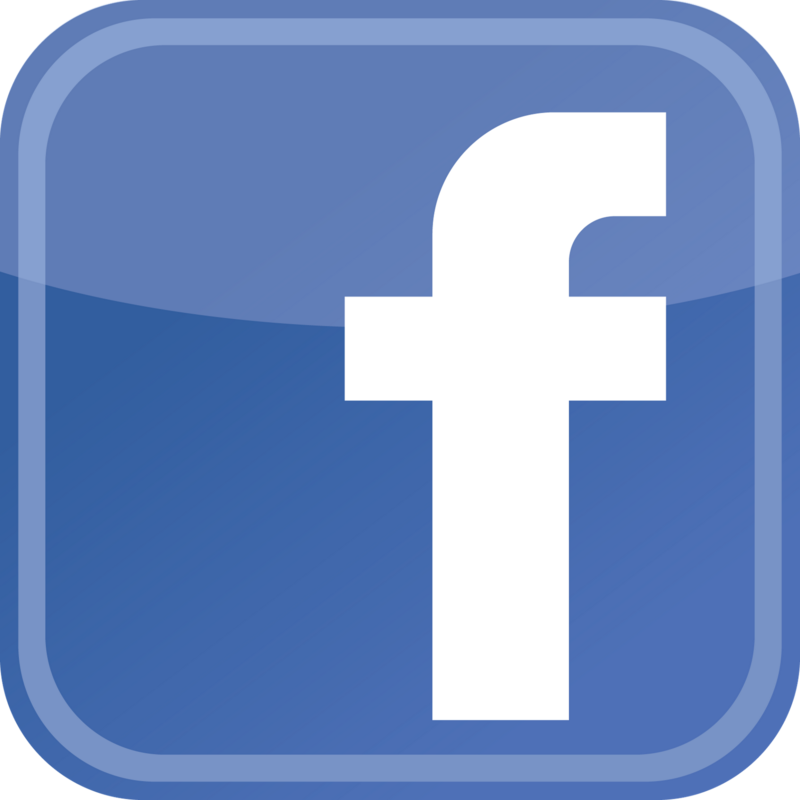 Send Scan Admission/Registration form as per prescribed session of admission. 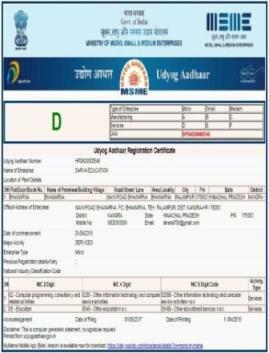 If Scan admission forms along with registration fee are not submitted in time then centre head has to pay prescribed late fee extra (if imposed by HO) along with registration fee and no excuse will be entertained. 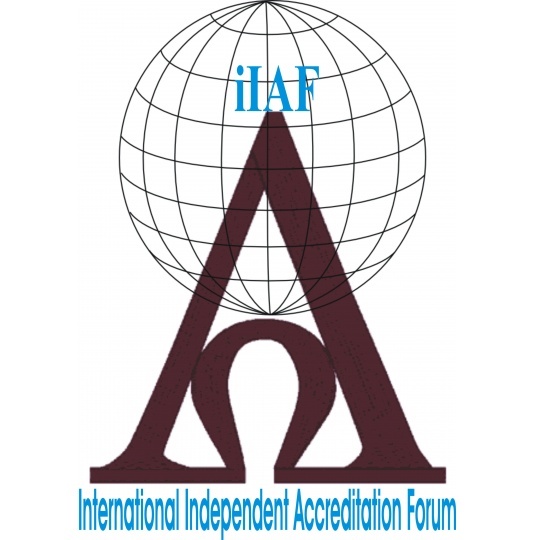 No Admission/Registration form without student signature, photo, required copies of certificates, Ph. No., Address, will be accepted. After submitting registration forms to Head Office-H.P. 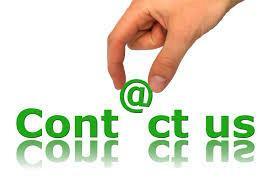 It will be the duty of affiliated computer education centre head to add/update student’s Roll No. 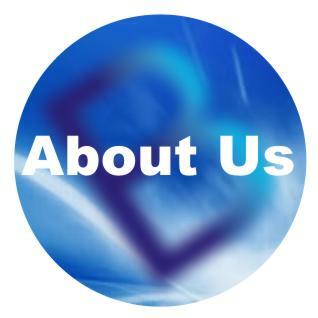 at website. 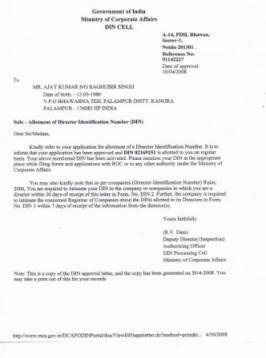 To run any scheme in respective computer franchise center permission form C.O- H.P is necessary. Centre Head will be fully responsible if he/she does not have any permission to run any scheme or courses in his/her centre and Sarva Education-SITED shall not be held liable for the same. 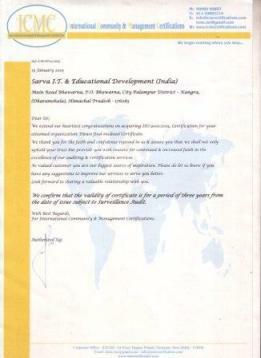 Centre head will mention courses fee structure at centre notice board and also send copy of the same to head office. 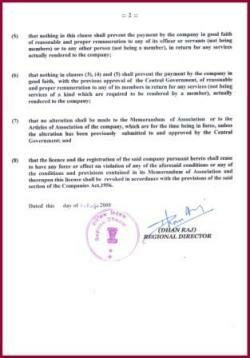 Centre head will not misuse any type of copyrighted materiel of SITED. 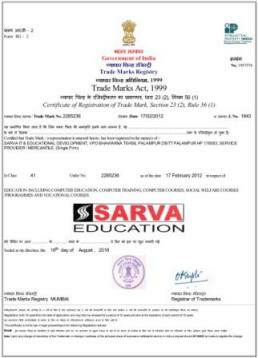 TO CONFIRM THE VALIDITY OF YOUR TRAINING CENTRE PLEASE VERIFY CENTRE CODE AT "VERIFY CENTRE DETAILS" COLUMN MADE AT- www.sarvaindia.com. 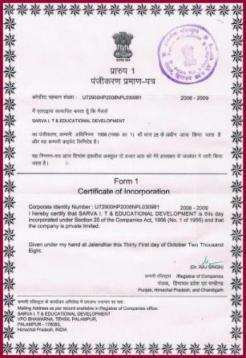 Notice board for NO.1 Sarva India Genuine (Trusted) Computer Education Affiliation & Cheap computer franchise abhiyan. 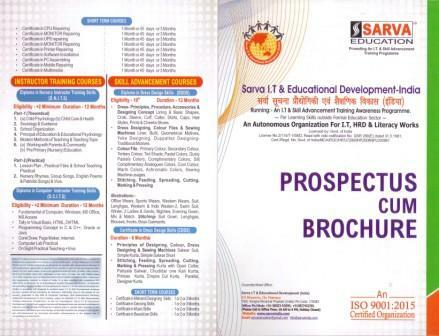 SARVA EDUCATION (A Division of SITED) has run LEADING_Computer Education Franchise offer or great computer affiliation business opportunity all across India:- If you (prospective computer Institute franchise owner) are seeking/looking for best/top computer education franchisee or computer franchise/affiliation abhiyaan form any part of of India, then Sarva Education (A Division of SITED) low/small/cost fee/low Investment computer franchise/computer affiliation business opportunity abhiyan is the best suitable chance/deal for you to open/start computer center/institute.